Edifier R1700BT review | What Hi-Fi? The Edifier R1700BT speakers are an immensely appealing proposition. They’re smart-looking, compact speakers, have Bluetooth 4.0 streaming and are a hoot to listen to. And they only cost £120. We’re rather fond of the Edifiers’ design. You only get one finish option with the speakers, but we don’t mind as the contrasting walnut vinyl and black body looks quite smart. There are a couple of clever design touches that we like, too. For instance, the speakers are built with a 10-degree upwards slant, which Edifier claims is to ensure the sound is directly aimed at the listener. We also like how the rotary controls for treble, bass, and volume are neatly housed in a little cut-away section on the side of the right speaker. It means the controls aren’t at the back of the speaker or marring the fascia – although left-handers may not be too pleased with the positioning. The R1700BTs are built solidly, especially for this price, although we take issue with the sharp edge on the tone controls. We prefer the speakers with the grilles on (they look neater), but you can pop them off to expose the drivers and bass port. The speakers come with a slim, plastic remote and while we’re not huge fans of this kind of flimsy control, it’s useful to have it close at hand to adjust volume or change inputs. Just make sure you don’t lose it down the back of the sofa. We imagine most people will be using the speakers’ convenient Bluetooth streaming feature to listen to music wirelessly. However, if you want to plug in non-sources like CD players or even use the R1700BTs as TV speakers, there are two pairs of RCA analogue inputs around the back. Edifier helpfully includes appropriate cables in the box, so you can easily connect a non-Bluetooth music player, too. Play Brenda Lee’s Let’s Jump The Broomstick, and the Edifier R1700BTs deliver the lively, nimble tune with heaps of enthusiasm. They sound fun. Lee’s soulful voice is expressive and rousing, and you’ll soon be snapping your fingers along with the bouncy rhythm. There’s a smooth approach here that’s unfussy with low-resolution streams over Bluetooth, which makes for long and comfortable periods of listening. That warm and richly detailed midrange works wonders with vocals, too. There is a slight thinness to the edge of the treble (listen out for the peaks in any Kate Bush song), but it’s not severe enough to veer into sharpness. It’s not the most precise or open sound, but the dynamics are pleasantly fluid. The R1700BTs are neither dinky nor huge in size, so they have a decent amount of weight to their sound. It gives guitar plucks, piano clunks and drum hits a satisfyingly solid feel. Where the Edifiers let us down is their handling of bass. Whether you’re playing Smashing Pumpkins’ angsty ballad Eye or First Aid Kit’s folksy My Silver Lining, the basslines stick out so much that they nearly overshadow the speakers’ overall performance. It’s not a question of volume, either. Even at quieter levels you can hear that ungainly bassline thumping away almost comically. It’s the one blip in an otherwise engaging and enjoyable performance. 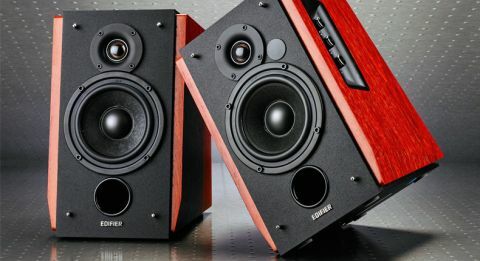 In the context of budget speakers, the Edifier R1700BTs are hugely appealing. They’re up against some tough competition in this market (the petite Wharfedale DS-1s are their closest rival at £130), but they’ve got a likeable sound that’s fun and easy to live with – they’re definitely worth a serious audition. If it weren’t for that errant bassline, they might even be deserving of full marks.